It’s always nice to find an article that supports your biases. I’ve been doing percutaneous tracheostomy since the 1990’s, and have used a variety of kits and equipment over the years. Some of these turned out to be rather barbaric, but the technique is now quite refined. A routine part of the procedure involved passing a bronchoscope during the procedure to ensure that the initial needle was placed at the proper level and in the tracheal midline. It was also rather frightening to watch the trachea collapse when the dilators were inserted. I abandoned using the bronchoscope in this procedure about 15 years ago. It was an annoyance to get the bronchoscope cart and a respiratory therapist to help run it. And to find someone available to pass the scope while I did the trach. So I added a little extra dissection to the technique, directly visualizing the trachea at the desired location. From then on, I had no need to see the puncture from the inside because I could see it quite well from the outside! An article in the Journal of Trauma demonstrated that this technique works just as well without the scope. The authors looked at their own series of 243 procedures; 32% were done with the bronchoscope, 68% without. There were 16 complications overall, and the distribution between the bronch and no-bronch groups was equal. Bottom line: In general, the bronchoscope is not needed in most percutaneous tracheostomy procedures. It adds complexity and expense. However, there are select cases where it can be helpful. Consider using it in patients in a Halo cervical immobilizer, the obese, or in patients with known difficult airway anatomy. And always do the more difficult ones in the OR, not the ICU. Reference: Percutaneous tracheostomy: to bronch or not to bronch – that is the question. J Trauma 71(6):1553-1556, 2011. What Is: A Passy-Muir Valve? Some critically injured patients undergo tracheostomy due to prolonged ventilatory failure. As they recover, the trach tube is usually downsized over time until it can be permanently removed. Unfortunately, this process may take a month or more, and the patient is generally unable to speak during this time. Writing and other forms of communication are both slow and frustrating, so a Passy-Muir valve may be attached to the trach to allow (nearly) normal speech during the recovery process. 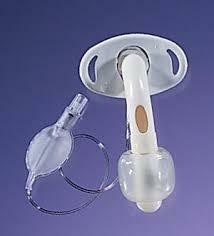 The Passy-Muir is a one way valve that allows air to be inhaled through the trach tube, but not exhaled through it. Instead, the air must circulate around the tube and up through the trachea to the pharynx. This particular brand has features that help keep the tube from collecting secretions during speech. See the brief video from the manufacturer below. 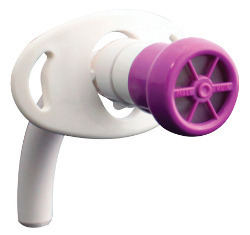 The downside to this device is that it increases the work of breathing during exhalation because air must flow around the entire trach tube, which is narrowing the available tracheal lumen. Note: if the trach tube has a balloon, it must be deflated or the patient will not be able to breathe! Some patients do not have enough strength to overcome this narrowing initially, and may not be able to speak or say more than a few words at a time. This improves with practice, and helps speed up tube removal. Use of a fenestrated tracheostomy tube with the Passy-Muir is helpful, because it has a strategically placed (but small) hole that allows air flow through a portion of the tube. 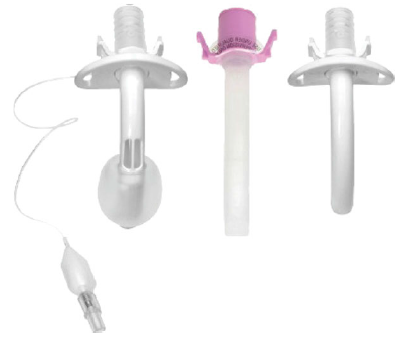 When this type of tube is used, the balloon must also be deflated, since it is subject to mucus plugging which would completely obstruct the airway. Work of breathing is still increased because this hole is small relative to the diameter of the trachea. Note: I have no financial interest in Passy-Muir Inc or any other tracheostomy product manufacturers. It’s always nice to find an article that supports your biases. I’ve been doing percutaneous tracheostomy since the 1990’s, and have used a variety of kits and equipment. Some of these turned out to be rather barbaric, but the technique is now quite refined. I abandoned using the bronchoscope in this procedure about 10 years ago. It was an annoyance to get the bronchoscope cart and a respiratory therapist to help run it. And to find someone available to pass the scope while I did the trach. So I added a little extra dissection to the technique, directly visualizing the trachea at the desired location. From then on, I had no need to see the puncture from the inside because I could see it quite well from the outside! An article in the Journal of Trauma shows that this technique works just as well without the scope. The authors looked at their own series of 243 procedures; 32% were done with the bronchoscope, 68% without. There were 16 complications overall, and the distribution between the bronch and no-bronch groups was equal.